From left are: Finneen Bradley, manager of North West Regional College's Careers Academy, and Lynne Kelly Carton, NWRC Careers, with the Beacon award for Careers Education and Guidance which was presented by the Association of Colleges at a Gala ceremony in London on Friday night. 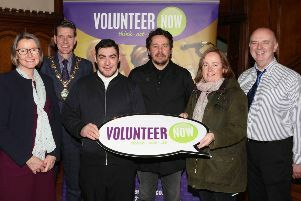 Also pictured are Kate Duffy, Director of Human Resources and Learner Services at NWRC, Gavin Stevenson, NWRC Careers, Stephen Sheridan, NWRC Careers, Leo Murphy, Principal and Chief Executive of NWRC and Gillian Moss, Principal Lecturer. (Picture Martin McKeown). North West Regional College has scooped a prestigious national education award, recognising the outstanding contribution made by its innovative and unique Careers Academy. NWRC was the only college in Northern Ireland to win a coveted Association of College’s Beacon Award, picking up the accolade for Careers Education and Guidance, at a gala ceremony in London last week. The Beacon Awards celebrate the best and most innovative practice among further education colleges, rewarding those that go above and beyond in providing high-quality technical and professional education. Finneen Bradley, manager of NWRC’s Careers Academy, said she was delighted to pick up the gong, adding that it underpinned the outstanding standard of education and training that is being delivered across all five campuses of North West Regional College. She said: “This award is testament to the sterling work that is taking place at our college. “When we first opened the academy it was because we recognised the need for careers education to firmly be embedded across all areas of the curriculum. “We believe not only in delivering the best education at NWRC, but we are passionate about building the careers and futures of our young people. Leo Murphy, Principal and Chief Executive of NWRC, said: “To become a Beacon College is an outstanding accolade, not only for NWRC, but for the city and region.